The primary aim of defence has to be getting the ball back as quickly as possible, as much as possible within the laws of the game. In my book, everyone must have this mindset: being alert, coordinated, determined, committed and acting with controlled aggression. In fact, we are going to ATTACK on defence to deny the opposition time and space, cause confusion and seize the initiative. Our league has good referees, often ones who don’t allow anyone to play the fine line between legal and illegal play, so I prefer to see the team playing honestly but with a unified urgency to get the ball back. This also means making efficient use of our resources and energy, namely not pouring people into rucks that are already lost. I’m happy for us to submit defeat at this ruck to have extra numbers for the next tackle contest. Attacking teams will typically put two or more into a ruck to secure it. If we have just one person to have a shove and be a nuisance (if they don’t disrupt the ball and give us an immediate opportunity! ), this gives us at least one extra defender to go for the ball or a choke in a double hit or act as a planned lone shooter. It’s this sort of thinking that makes defending more than just tackling and preventing points from being scored! Communication – Constant and specific communication helps us point out threats, declare responsibility (again, from inside-out), make adjustments and even target opportunities. I have no problem with ‘Big Talk’ like “Hold!” and “Up!” as they are great commands to coordinate the defensive line, but the constant bleating of those words not only gets on my nerves, it’s white noise that prevents more relevant communication from occurring as the play unfolds. Kept it short, loud, specific, and ideally attached to a name or at least with some sort of direction/acknowledgement from the people around you. Layered Structure – Generally speaking, the defensive line should be a flat wall that offers no gaps or holes for the attacking team to expose. That means no one up ahead of or behind the rest in the main line. A good attacker will go for the space left open and draw extra defenders, opening new space where they were if she doesn’t get through. That said, a completely flat line is an easy one to kick against or if there’s a breach, it’s more difficult for covering defenders to stop it. So, our defensive line has a few layers to it. 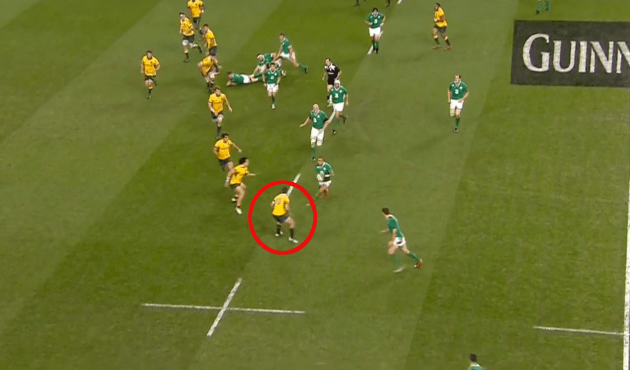 The obvious one is the full back who generally shadows the opposition fly half and then tracks the inside of the ball, watching for cut backs but then taking the last attacker if there’s an over-lap out wide. The wings should hang back a few meters to deter / cover wide kicks, coming up into the line when it’s obvious the ball is going to be run. The middle zone between them is covered by the scrum half – who has an important ‘traffic cop-like’ job organising the tackle contest, but then must sweep behind the defensive line, again staying inside the ball, in case of line breaks or short kicks. Hunting Pack Mentality – When the ball comes out of the scrum / lineout / ruck / maul, we have to come forward and take away the space and time the attacking team has. This MUST be coordinated, without the aforementioned shooters / laggers-behind, compromising the integrity of the defensive structure. It must also exhibit the qualities listed in the opening paragraph. We must dominate the contact area to get the ball back by aggressive but legal means. Simple as that. The pack mentality provides focus in that defending is never an individual effort, usually requiring at least three players to contain the ball carrier and her immediate support options. Tackle Selection – Not everyone can make the full range of legal tackles allowed in rugby, and that’s fine. Footwork becomes even more important for those players to ensure they make the tackle as they would prefer. Hopefully everyone can strive to have as many tackles in their bag of tricks as possible because not every contact situation is the same and some can allow for a better opportunity to dominate the contest. Quick take downs allow the tackler or tackle assist player to have a quicker shot at stealing the ball, especially in the open field. Higher smothering tackles can prevent tries close to the line and allow assisting players to ‘choke’ the ball carrier, holding her up for a scrum turnover. Hammering a ball carrier backwards can have both a psychological effect that uplifts the team, but also gives the tackler the best chance of ending up on top, bouncing to her feet and getting hands on the ball. Blitz tackles can have a similar effect and also sets the tackler up to get or cause an interception as well. Supporting players need to be aware of the body language of each as team mates line up tackles so they can support in the best way (helping out or staying out, mirroring the offload threat or getting ready to pounce in for a steal). 1. Turnovers: When turnovers occur, someone needs to have a quick assessment to shout out the best course of action. To doddle or choose the wrong option wastes the opportunity to exploit a team that’s probably lying deep and is certainly disorganised. Typically, two passes away from the contact area will find this space. If someone does have a gap in front of them, support must funnel through and look to move the ball to space quickly. Kicks are usually only a good option if we have a legitimate shot at regaining possession from exposing the lack of covering players from the opposite team (maybe the wing and full back were part of the turnover and we have speedsters in place to chase a well-placed kick). 2. Kick-Chase: When chasing the kick, it’s important to get a group of at least three players in place quickly to either re-gather or contain and hopefully dominate the receiver. The ideal shape they take is not flat, because if one gets beat, they all get beat. If they adopt a ‘flat’ arrowhead shape, with the point taking the ball, then the ‘wingmen’ have time to make an adjustment if this occurs. Also, if the ball is re-gathered by the tip of the arrow, the wingmen are in good positions to support.